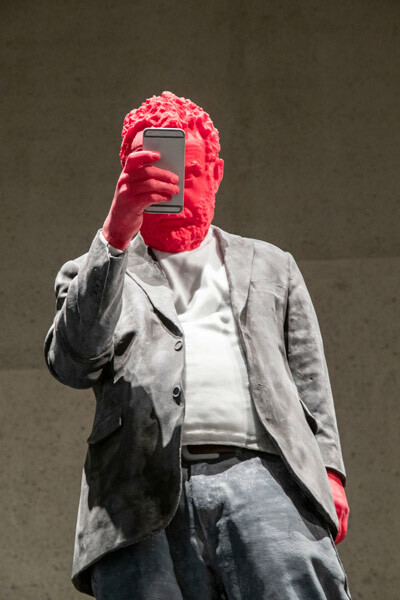 Urs Fischer, Francesco 2017. National Gallery of Australia, Canberra Purchased with the assistance of the Foundation Gala Dinner Fund 2019 © Urs Fischer, courtesy Sadie Coles HQ, London. If you’re going to spend a million dollars on a major new acquisition, would you expect it to melt in the next six months? 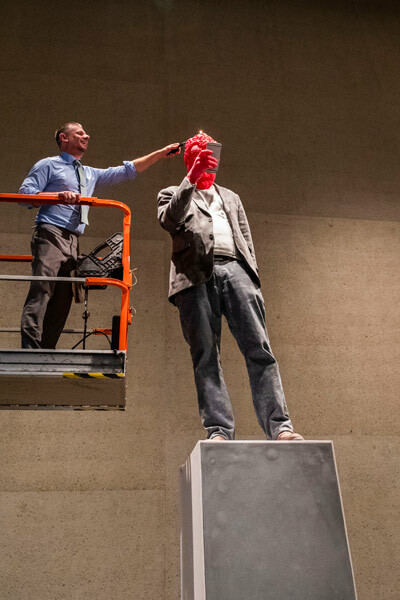 On Friday morning (15 March) National Gallery director Nick Mitzevich ascended a scissor lift in front of assembled media and lit the wick on a four-metre monolithic statue of a man made entirely of wax. The work is by Swiss artist Urs Fischer and portrays his friend Francesco, a curator. Francesco is perched on a fridge, not a plinth, and the refrigerator door is open at the back to reveal an assortment of fruit and vegetables. Francesco himself is hunched over in that most emblematic of modern poses, looking at his smartphone. The whole thing is made of wax apart from the armature inside the fridge and the idea is that over a six month period, the wax will gradually melt into a mottled puddle all over the plinth as the whole enormous candle disintegrates in front of our eyes. Urs Fischer’s Francesco 2017. National Gallery of Australia, Canberra Purchased with the assistance of the Foundation Gala Dinner Fund 2019 © Urs Fischer, courtesy Sadie Coles HQ, London. It will take around six months for the sculpture to melt fully and yes, the Gallery has plans in place for managing the wax flow. At the end of that time, the work is reborn: Mitzevich said that as part of the acquisition, the NGA receives a cast, a mould and a manual to recast the pieces as often as they like. Curator Jaklyn Babington says the artist is having a bit of a dig at all the grand statues of men on plinths around the world. “He’s not in a heroic pose we’d expect, he’s on a fridge, not a pedestal so the artist sets up this man and then burns him down. 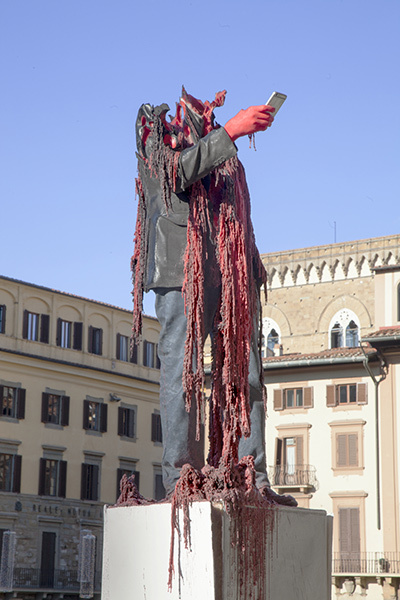 Urs Fischer Francesco 2017 (installation view), Big Clay #4 and Two Tuscan Men, Piazza della Signoria, Florence, Italy, 2017–2018. National Gallery of Australia, Canberra Purchased with the assistance of the Foundation Gala Dinner Fund 2019 © Urs Fischer, courtesy Sadie Coles HQ, London Photography: Stefan Altenburger. She thinks we need to take time with pieces like this to absorb the many ideas embedded in them. And, as the director says, “We are used to artworks that are static. This one has a process and life of its own. So it’s a poignant and at times macabre metaphor for the lives we lead”. Francesco 2017 is at the NGA, free admission. Another waste of taxpayers’ money. But then it’s only a million dollars so who cares.